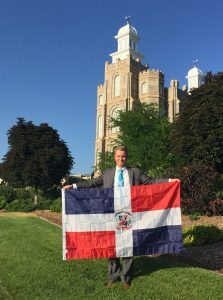 Elder Brennan Conrad,18, from Hyde Park, Utah who passed away Wednesday after falling from the roof of his apartment building in the Dominican Republic. The family of an 18-year-old man from Hyde Park, who died Wednesday while serving a mission for the Church of Jesus Christ of Latter-day Saints, has released a statement. Elder Brennan Conrad passed away after falling off the roof of his apartment in the Dominican Republic. A message, written by Hailey Conrad, Brennan’s sister-in-law, explained how the family was heartbroken to receive the tragic news. She also described the young missionary’s love for serving the people in the Santo Domingo East Mission. Family photo of Elder Brennan Conrad,18, from Hyde Park, Utah. Taken in front of the Logan Temple before leaving on a mission to the Dominican Republic. Brennan Conrad had been serving as a missionary since August 2018. Prior to leaving, he graduated from Green Canyon High School, where he played on the lacrosse team. Brennan’s mother, Melanie Conrad shared on Facebook some of her son’s early letters. In them, he described the area he lived in as being very poor, with working electricity only 20 percent of the time. He wrote that there was no hot water, which meant freezing cold showers each morning. Despite the challenges, he expressed gladness in being able to serve. One week before he died, Brennan was able to receive a package from his family with handwritten letters that he had requested. They also got to video chat together on Monday. Funeral services will be arranged once Conrad’s body is transported back to Utah. A GoFundMe campaign has been set up for the Conrad family, for those wishing to donate: gofundme.com/in-memory-of-elder-brennan-conrad.